Google recently has launched a new service called “Knol” which allows users to contribute their knowledge in a wiki-like format. Knol is very different from other e-encyclopedias as it stresses greatly on accountability and regulation over an author’s article. Unlike Wikipedia, who allows anonymity to the author, Knol permits authors to write on their topic of choice, but only after the author is verified authentic to their respective competence level. 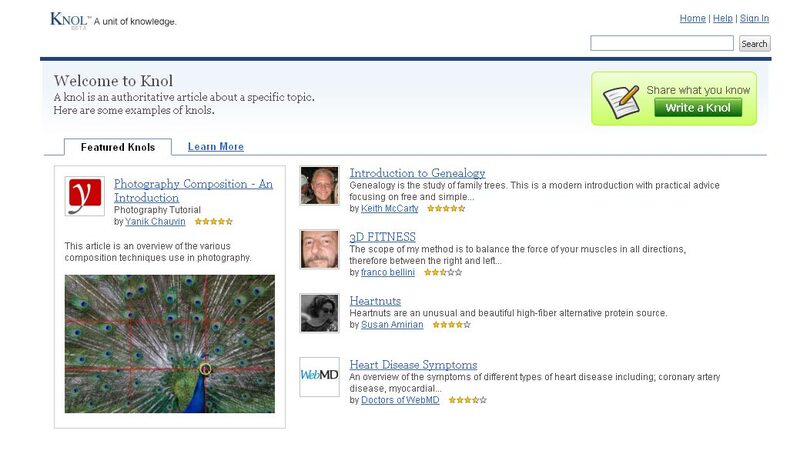 Knol also allows its authors to use their published articles to generate income. Google has utilized this opportunity to explore ways in generating income with the rise in interest of user-generated content. “We are deeply convinced that authorship, ‘knowing who wrote what’, helps readers trust the content,” said Cedric DuPont, product manager for Knol. The name of the service is a play on an individual unit of knowledge, DuPont said, and entries on the public website are called “knols.” Google carried out a restricted test of the site starting in December. “An enormous amount of information resides in people’s heads: millions of people know useful things and billions more could benefit from that knowledge. Knol will encourage these people to contribute their knowledge online and make it accessible to everyone.” said DuPont. To generate revenue, authors are persuaded to use Google’s AdSense program. Alongside their published content, authors can slot in word or image advertisements. Depending on the popularity of a knol, Google advertisers could pay more than usual to run their adverts with content with highest hits. With all the information available on Knol, there is no actual body which regulates information, thus if a reader finds any content objectionable, they will be able to notify Google and have the knol amended or removed. Although Google’s idea is different than Wikipedia’s, it is not innovative and sites like Encyclopedia Britannica, Citizendium, and Mahalo have already implemented a very similar concept. Knol wants experts to write on topics, regardless how broad or slim their knowledge is, but impose that authors place their real names and designations on their work. Full control is given to an author of a knol; the choice whether to allow the public to make changes to their knol or completely lock the article lies solely with its author. “What we want to get away from is ‘this last voice wins’ model which is very difficult if you are a busy professional,” DuPont said. Google wants to rank entries by popularity to encourage competition. For example, the first knol on “Type 1 Diabetes” is by Anne Peters, director of the University of Southern California’s Clinical Diabetes Programs. As other writers publish on diabetes, Google plans to rank related pages according to user ratings, reviews, and how often people refer to specific pages, DuPont said. Another older version of a user content-generation is Blogger. Both Knol and Blogger allow users to generate and monetize content, but the main difference is that Knol provides readers the personal identity of an author and topic-based structure for content, compared to Blogger, which supplies a domain identity and time-based structure for content. Most of the authentic authors prefer to verify their identity in the hopes to boost reader numbers. The authentication places a reassuring “verified” badge on their profile. However, getting a positive verification from Google is not very difficult. All that is required from the author is to submit a phone or credit card number, which is then used to check with national databases. Furthermore, any user with a Gmail, Google Reader, or any other Google account available can automatically qualify. This is hardly reassuring. Citizendium, on the other hand, is more dedicated to providing readers with authentic material. Hopeful writers are to send in an account application, their curriculum vitae, and any links to previously published material on the internet to validate undertakings, which is then considered by an assessor and a result will be sent within 24 hours or less. Still in its teething stages, Knol clearly has a long way to go before it is able to achieve the capability and collective content of e-encyclopaedias such as Wikipedia. DuPont said that rather than competing with Wikipedia, Knol may end up serving as a primary source of authoritative information for use with Wikipedia articles. “Knols will fill gaps on what we have on the web today. That is what we hope,” DuPont said. At this point many of the volumes on Knol are simply “copy paste” Wikipedia items – the term “technology” by Alexey Tseitlin for example– seems like a 1:1 copy of the Wikipedia item. If Google wants Knol to be a unique e-encyclopaedia with distinct content it will have to find a way to fight this plagiarism problem. TFOT has previously written about Mahalo – the human powered search engine discussed above, which relies on a group of full-time experts known as “guides,” who manually sift through all search results of the internet’s most popular search terms and filter out any results that do not meet the engine’s strict requirements. You can also check out our article about P4P, next generation P2P, which is an advancement to file sharing technology. This system has the ability to make internet service providers (ISPs) and peer-to-peer (P2P) software providers work together in order to deliver data in a more efficient manner. Additional information about the Knol project can be obtained at Google Knol’s website.